This is an early Christmas present! I’m thrilled to announce that my first ever self-published book is now available at Amazon.com: Simplify Life... and Make it Count: Focused living for lasting impact! There are three ways you can support me in this endeavor. 1. Buy my book at Amazon. Of course, this is the best way because you are actually helping our family sustain our living. If this is your option, I will be very, very grateful and will include you every day in our prayers. Bonus is that you will feel the satisfaction of knowing that you have contributed something great to someone, and that will leave a lasting impact (at least on me). 2. Subscribe to my blog, Minimalist on Purpose. If you feel that you don’t have the means to buy the book or you’re not that convinced yet, you can subscribe via email here at the upper right sidebar of my blog and get free content every time I post something new. I can send you a free pdf copy of the book when you subscribe. 3. Like my page on Facebook. Like the Minimalist on Purpose page on Facebook and receive inspirational posts on simplifying life, following your passions, discovering your purpose, and accepting your calling. You can also add me as a friend and private message me your email address and I can email you the free pdf copy without you subscribing here. 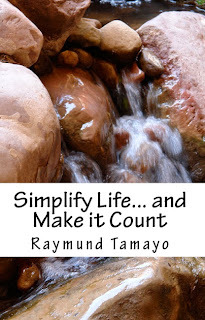 For those who are in Luzon and wanted to purchase a paperback copy of the book, kindly email me at raymundtamayo@gmail.com. We can work something out to give you the best deal. When you already have a copy, you are welcome to share the book to all your friends, family, loved ones, or anyone and everyone via email, or thru social networking sites. My only request is for you to not sell it or charge it in any way.